A brand new adventure-activity will help you to see Niagara Falls in a whole different way. The Zipline to the Falls will enable the rider to see the waterfalls, the gorge and the surrounding beauty from high above. This Canadian located attraction has been constructed by WildPlay Element Parks and consists of four ziplines between two points – the Grand View Marketplace and the historic Ontario Power Company building at the base of the Horseshoe Falls. This attraction has been created keeping in mind the eco-sensitivity of the falls. These high-speed cable lines are 2,200 feet long and you can traverse this length as you zip through the course. 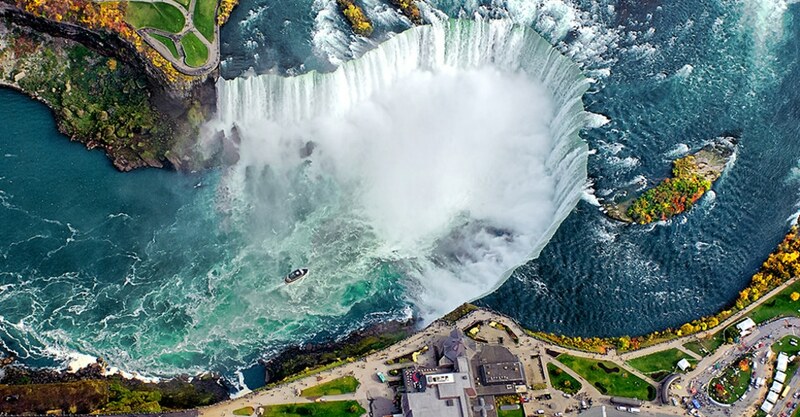 As you hold on to the pulley or harness and cruise along, you can get a bird’s eye-view of the stunning landscape notably the Canadian Horseshoe Falls and the American Falls. The picturesque river and the Niagara gorge views too leave an indelible impression. Excitement and exhilaration are the two major feelings that you will experience as you try out this adventure activity. Even if you are slightly nervous before you take off, the adrenaline rush, the thrill and the view will replace your fear. You can feel the buzz as you zip along and enjoy the beauty of nature. Children aged seven and above as well as adults can enjoy this activity although there are certain guidelines that have to be followed before you undertake the ride. All riders must be between 29 and 115kgs, and those aged 14 and under must be accompanied by a responsible adult. Fitted as well as weather-appropriate clothes plus secure footwear are essential. If you have long hair, it would be ideal to tie it up during the activity. A signed waiver form is mandatory before you ride the zipline. The rides are priced at Canadian dollar 49.99 and above for a single ticket. Besides the zipline, there is also a Whirlpool Adventure Course at Thompson’s Point where visitors can enjoy themselves. The activities here include ziplining, climbing, jumping and swinging aerial games for children aged five and above, and adults as well. The cliff-side courses are particularly exciting. So if you want a whole new perspective of the Niagara Falls and want to do so in a thrilling way, you must try the Zipline to the Falls.